The Grand Island Saddle Club was organized in June of 1945 by a group of business people brought together by their mutual love for horses and a need for a place to keep them. The stables were built with an adjoining clubhouse, which at first served only sandwiches and an occasional pot luck dinner. 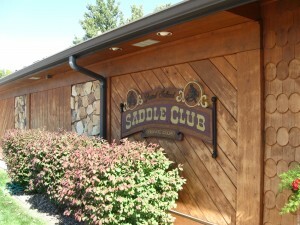 As time passed, the club grew and a horse show arena was built where sanctioned rodeos and shows were held. The kitchen was enlarged and a menu of steaks and chicken was added to accommodate the members. The club continued to grow until 1980 when it was partially demolished by the tornadoes that struck Grand Island. Through tremendous efforts by the then board of directors, the club was rebuilt into what you see today – one of the finest private clubs and dining establishments in the Midwest.